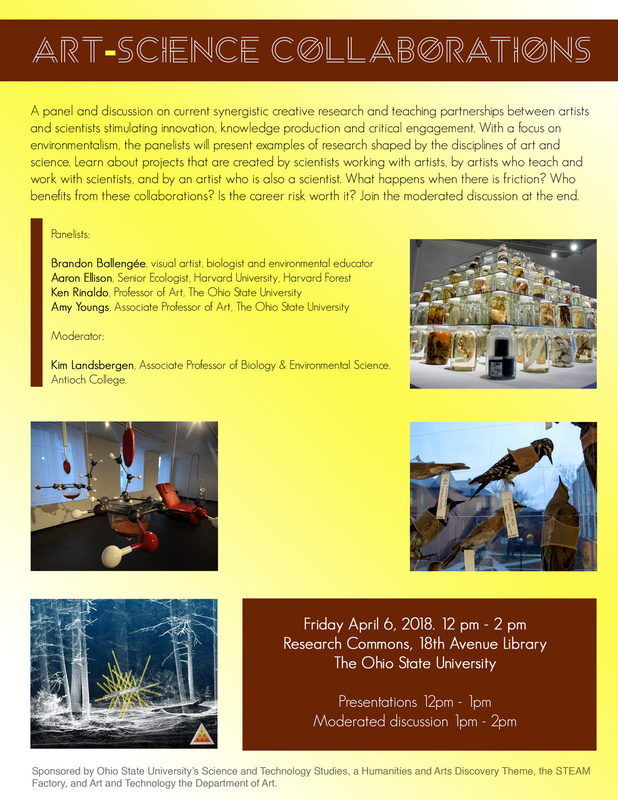 Rose Stark, MFA student graduating Spring 2019 presents her installation work and describes how her experiences as an animator influenced the way she approached building these sculptures for her exhibition, Transluminal. 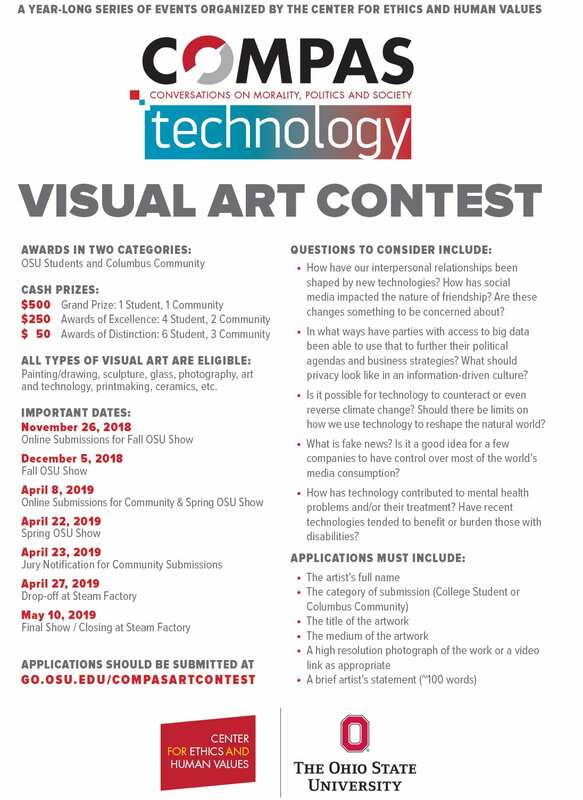 The Center for Ethics and Human Values has teamed up with the Department of Art to create an art contest related to the theme of “Technology”. 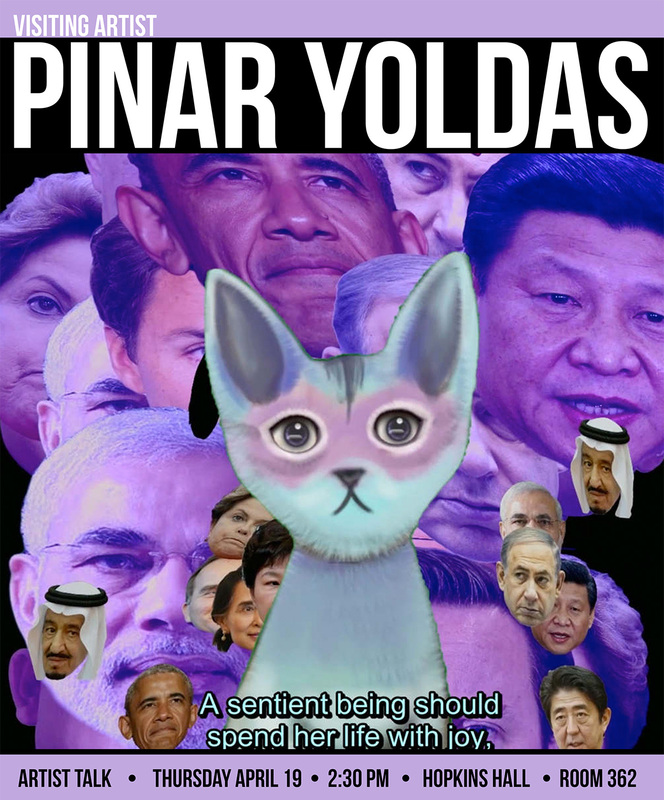 Artworks of all media are eligible. 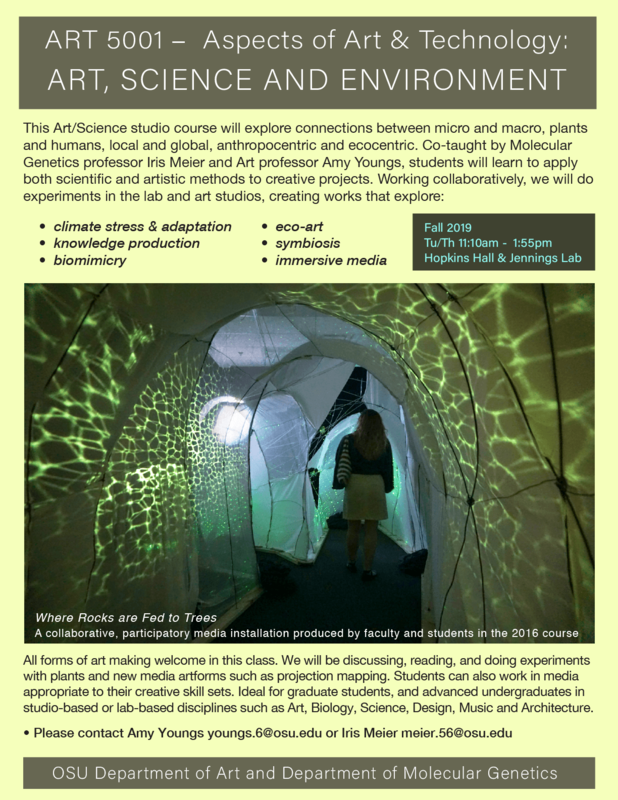 Graduate and Undergraduate students apply by filling out the online form and by exhibiting their artwork in the Fall and/or Spring open house exhibitions in the Department of Art. Prizes will be awarded at both times and the award-winning artworks will be exhibited at the STEAM Factory, which will include artworks juried from the larger Columbus community. More info about this year’s COMPAS theme and events. 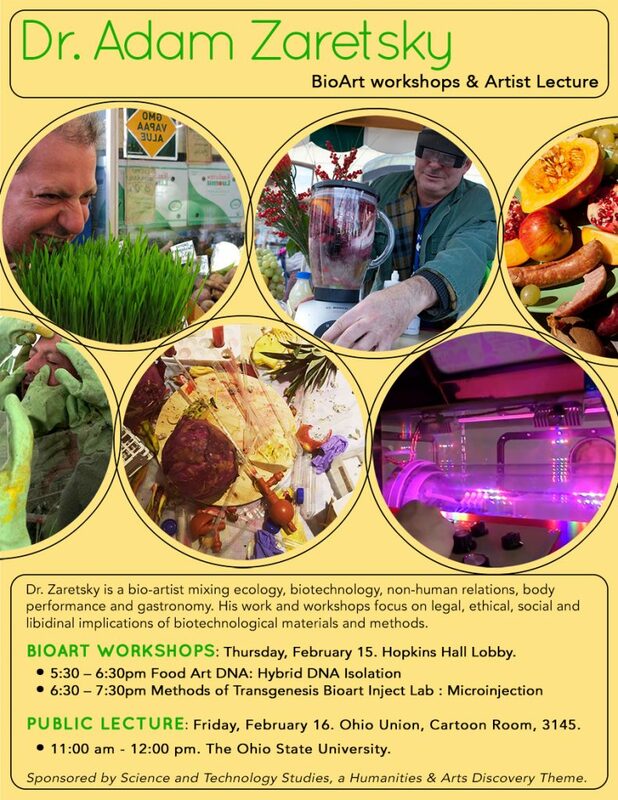 Please join us for two BioArt workshops – a hands-on, do-it-yourself DNA isolation, followed by a novel culinary experience: Radical Gastronomy Microsushi Injection Lab! 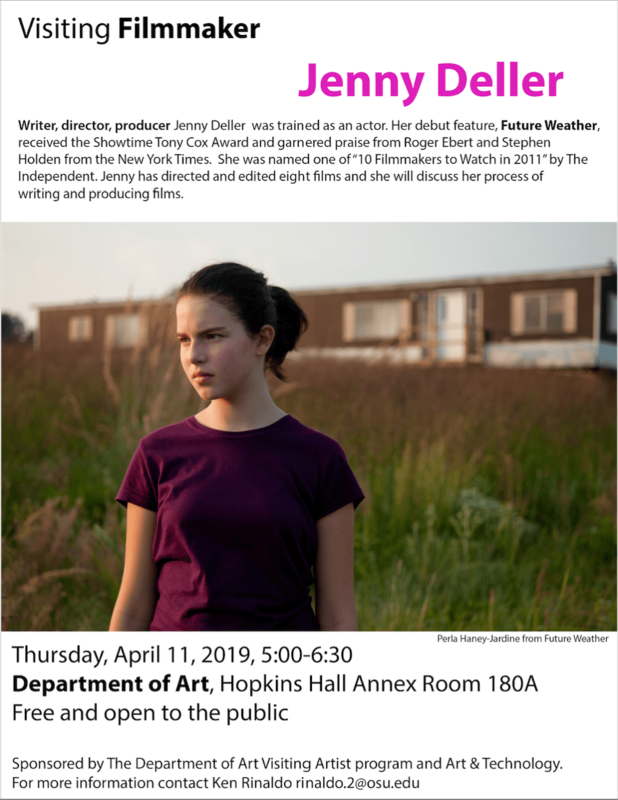 Both on Thursday, February 15th, in Hopkins Hall Lobby, at the Ohio State University. • 5:30 – 6:30 pm: The Hybrid DNA Isolation Skill-Share Lab • Zaretsky will show us how to extract DNA from Anything Living. Our lab is all ages and animal and tree nut free. Our lab is a communal performance ritual that can easily be repeated at home. Participants are asked to bring non-animal, living samples for DNA Isolation. • 6:30 – 7:30 pm: Methods of Transgenesis Bioart Inject Lab: Microinjection • Participants will learn about the history of microinjection and practice Do It Yourself (DIY) microinjection. A Microinjector is a thin glass micropipette. The tiny needle is so small that it can inject directly into the nucleus of living cells. It is often used to get novel genes into the genomes of living cells. DNA is mixed with liquids and injected into various living beings. This is known either as transgenesis transfection, trans-gene infection, transformation, genetic modification or transgenic production. We will talk about the history and symbolism of microinjection development and the ethics of genetic modification. Participants will have a chance to test a variety of DIY and commercially available microinjectors. We will work on making gourmet microsushi with sterile solutions of wasabi or soy sauce and perhaps microinject some zebrafish embryos with DNA from the Hybrid DNA Isolation Lab. The goal of these labs is to create an open-ended interface between life and the arts. To keep all expressive options dilated, the focus is not on the logic of the biologic. Instead, our cultural relationships to the world of life are exposed in their contradictory and slippery illogics. The interfaces between human society and the ecosphere are identified, rethought and collaged together to form signs of definitional breakdown. Consider the categories for whom should be treated to artistic xenophilia: Food, Nature, the Laboratory, Our Bodies and other non-humans. By defining where and how we interface with all lifeforms and by mixing these logics into art media instead of fact production, we arrive at unusual conceptual re-evaluations… towards a kinship with biodiversity and general life as complex for appreciation. For this experiment, we want as many varieties of non-animal samples as possible. Participants have been requested to bring one or more samples of living, growing, raw or recently alive materials for Isolation and Purification of an admixture of these samples. We will take a portion of everything that is provided. These samples will be mixed together during the isolation. Through a series of simple protocols, using household items, the hybrid DNA is extracted and collected by the group. We then use artistic techniques to work with this New and Very Old Media to make monoprints, sculpture and conceptual art. 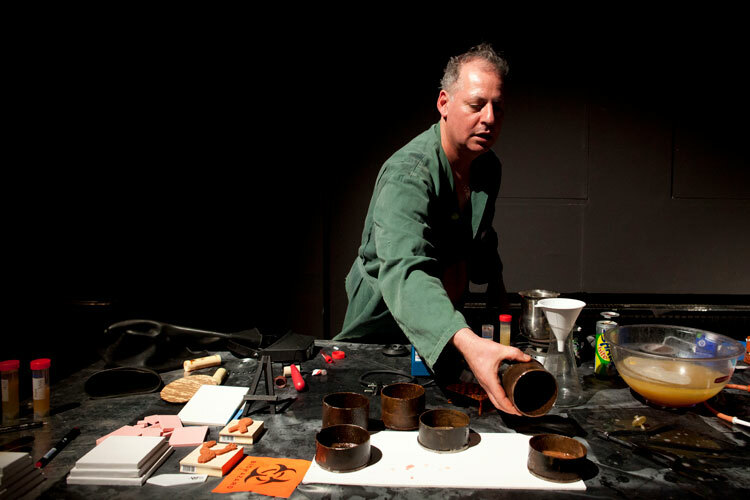 Adam Zaretsky is a Wet-Lab Art Practitioner mixing Ecology, Biotechnology, Non-human Relations, Body Performance and Gastronomy. Zaretsky stages lively, hands-on bioart production labs based on topics such as: foreign species invasion (pure/impure), radical food science (edible/inedible), jazz bioinformatics (code/flesh), tissue culture (undead/semi-alive), transgenic design issues (traits/desires), interactive ethology (person/machine/non-human) and physiology (performance/stress). A former researcher at the MIT department of biology, for the past decade Zaretsky has been teaching an experimental bioart class called VivoArts at: San Francisco State University (SFSU), SymbioticA (UWA), Rensselaer Polytechnic Institute (RPI), University of Leiden’s The Arts and Genomic Centre (TAGC) and with the Waag Society. He has also taught DIY-IGM (Do-It-Yourself Inherited Genetic Modification of the Human Genome) at New York University (NYU) and Carnegie Melon University (CMU). 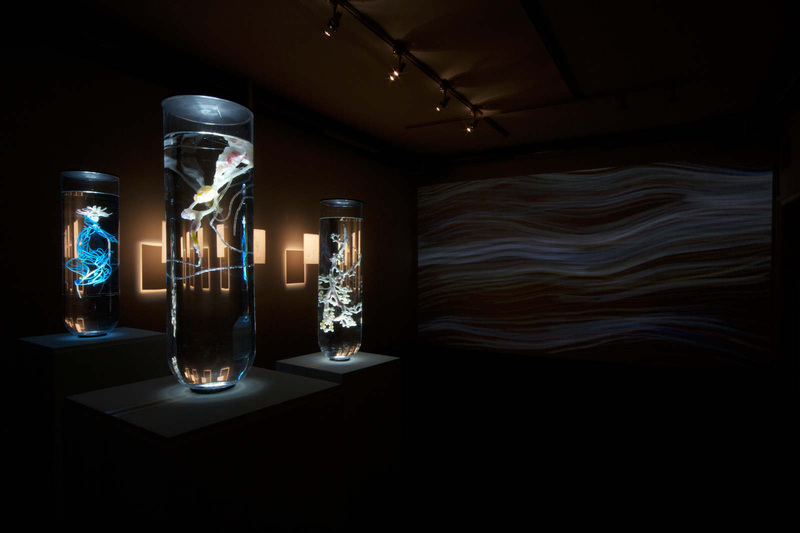 He also runs a public life arts school: VASTAL (The Vivoarts School for Transgenic Aesthetics Ltd.) His art practice focuses on an array of legal, ethical, social and libidinal implications of biotechnological materials and methods with a focus on transgenic humans. Adam is currently Media Arts Faculty in the School of Communication and the Arts at Marist College. Zaretsky received his BFA in Studio Art from the University of California at Davis, his MFA in Art and Technology from The School of the Art Institute of Chicago, and his Ph.D. in Integrated Electronic Arts from Rensselaer Polytechnic Institute. 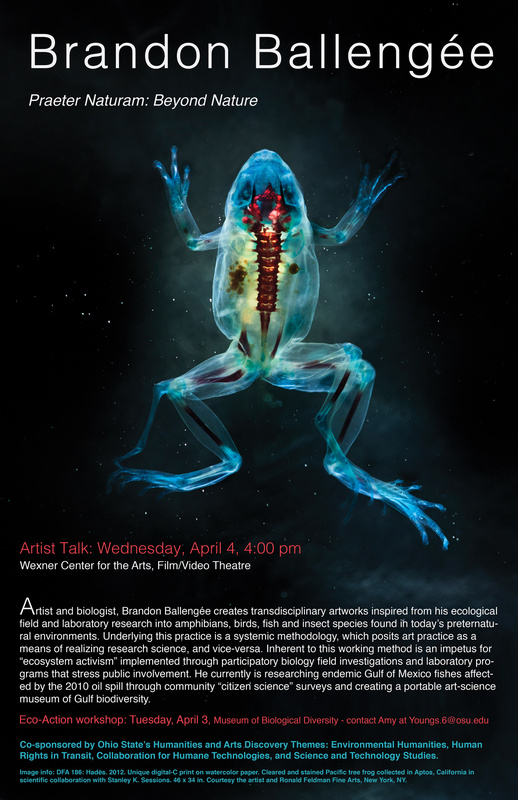 Please join us for Adam Zaretsky’s artist talk on Friday, February 16th, 11 am – 12 pm in the Cartoon Room, at the Ohio Union 1739 N High St, Columbus, OH 43210 . Sponsored by Science and Technology Studies, a Humanities & Arts Discovery Theme and organized in association with the Questioning Science in Uncertain Times workshop. 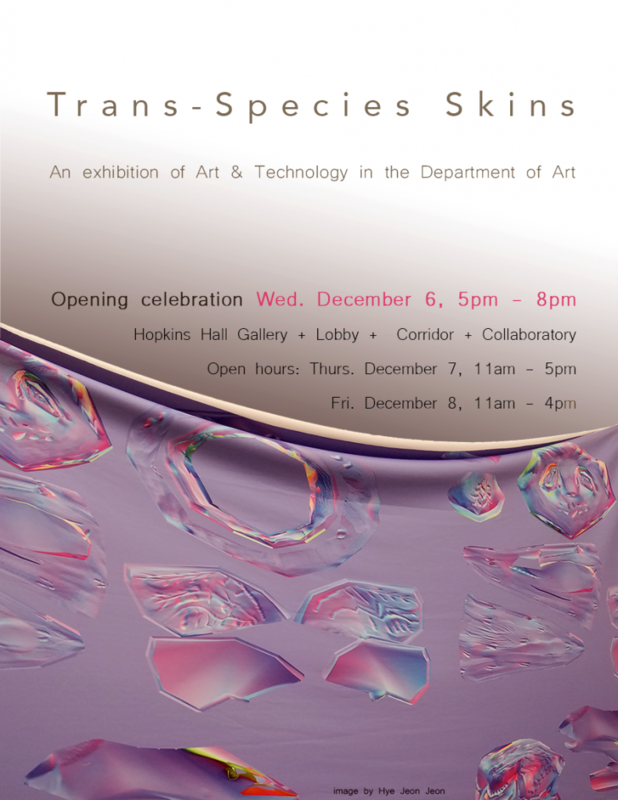 Trans-Species Skins is a themed art exhibition exploring skin as a metaphor and substance that transcends species categories. Skin is the multilayered and multipurpose organ that shifts from thick to thin, tight to loose, wet to dry, across the landscapes of bodies and machine interfaces. Natural and artificial skin responds to heat, cold, pleasure and pain. It lacks boundaries and flows seamlessly from exposed surfaces to our internal cavities real and virtual. It is a self-repairing, semi-permeable surface, with inner layers that are flush with nerves and glands, sensors and chips. New tools allow artists, designers, and engineers to look at a new emerging organicism that takes shape across the surface of the grown and manufactured. Skins can modulate meaning, touch, function and can provide feedback and change with light and heat. Flexible membranes embedded with sensors and materials are bent, impregnated, or inflated to become structure. Re-skinning allows deceit; the non-living can approximate life, and the living can appear otherwise. 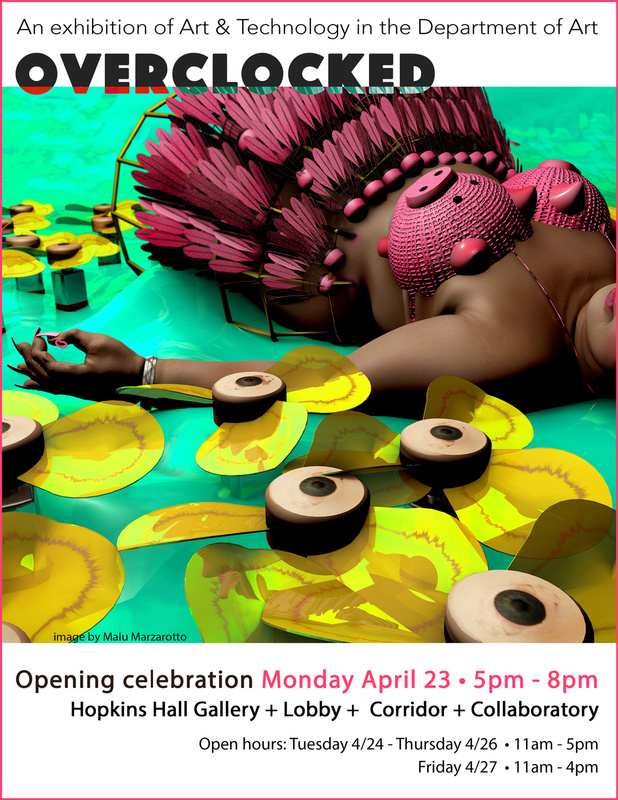 This semester, students in the Art & Technology courses – ranging from animation, art-science, digital imaging, and 3D modeling to robotics – have created individual and group artworks related to this theme and they will be presenting them in this juried exhibition.